The Glowing Plants Kickstarter, the first-ever crowdfunded synthetic biology campaign, is winding down into the final hours. 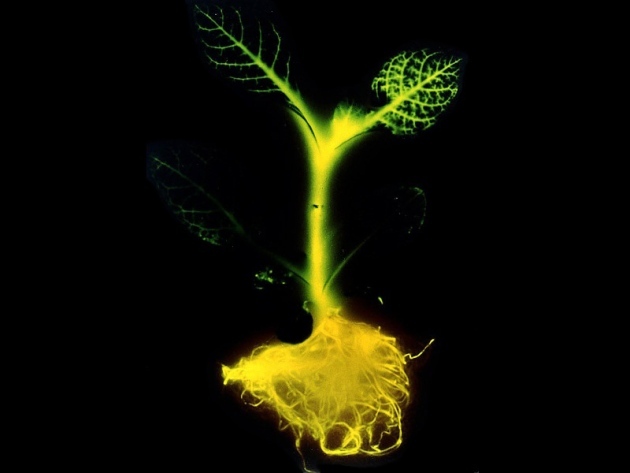 Launched on April 23, 2013, the campaign aimed to create a glow-in-the-dark plant while showcasing the technology of synthetic biology. It also served as a vehicle to introduce two startups in the sector: Genome Compiler Corporation and Cambrian Genomics. The campaign has been wildly popular, attracting widespread media attention that saw the initial funding target of $65,000 be surpassed in just two days. Had that breakneck pace continued, the campaign would have pulled in about $1 million, but it now looks to finish with about $465,000 — still a remarkable achievement for a bioscience project. Depending on the amount pledged, backers will get conventional swag, like stickers, T-shirts, or a how-to book, to more exotic rewards like a do-it-yourself Glowy plant kit, or a message, written in DNA, spliced into the genome of the plant. However, the most popular pledge by a wide margin was for something decidedly low tech: seeds. Contribute $40 and the project organizers promised to ship 50–100 seeds for people to grow their very own glowing plants, provided they lived in the US. In America, the project isn’t against the law, albeit largely because the current regulations for plant biotechnology weren’t crafted with ornamental glowy plants in mind. This said, the plant is about as harmless as a modded living thing can be. It’s not part of the food chain. It’s not going to be eaten or smoked or made into herbal tea. In the wild, it’s unlikely to compete well against natural species. If the project is successful, the plant should glow in the dark. But don’t throw away those compact fluorescents or LED bulbs just yet. At best, it will be a dim glow. Where the project really shines, though, is in seeding interest and discussion. It’s convinced almost 8000 people to chip in a few bucks. It’s also received millions in media attention. It’s been tweeted and “liked” and commented on. It’s fueling conversations on biosafety, patents, liability, open vs. corporate science, legislation, and more. But overall, the response to the Kickstarter has been positive and playful, not heavy-handed. And why not? Glow is a natural phenomenon in nature. It’s been extensively researched and turned into a useful tool for molecular biology, a visible marker for successful gene delivery. Researchers have been making things glow for decades, for basic research and as a first step toward more complex engineering. Glow even became art in 2000, when Eduardo Kac created a transgenic glowing bunny rabbit named Alba, who quickly became a media sensation. A steady stream of glowing animals have followed. Today, using genetic engineering to make something glow is what we teach kids. It’s a toy. In 2007, I purchased a kit online that included freeze-dried bacteria, plasmid DNA that contained code for green fluorescent protein (GFP), and detailed instructions on how to make glowy bacteria — all for $24.95. What was remarkable to me was the box listed it for ages 8 and up. Which probably explains why the FBI, USDA, FDA and other groups charged with ensuring US biological security haven’t been too concerned about glow-in-the-dark arabidopsis plants. They’ve got more serious business to attend to. In fact, the only group to express any real concern over this Kickstarter has been the ETC Group. ETC monitors emerging technologies particularly as they are applied by large corporations. The rapid rise of synthetic biology over the last decade has concerned them greatly, and they’ve fashioned themselves as the Greenpeace of the field. Personally, I strongly believe that voices of dissent, concern, and opposition deserve to be heard. I’m glad ETC members are at synbio conferences and are willing to engage in debates. I like them. They are thoughtful and engaged. And some of their marketing strategies, particularly their posters, are brilliant. But their opposition to this project, while predictable to me, invoked an odd reaction: I felt a little sorry for them. I’m used to seeing ETC go after industry giants. To me, this feels like they’re trying to squash a mosquito — and all they have is a hammer. It’s not their fault. Over the last decade, genetic engineering has moved from large groups into the hands of individuals and small groups, the same dynamics as we see with many other technologies, including computers. I can’t imagine how frustrating it must be to try and stand in the way of exponential technological progress. It’s a losing battle. Glowing plants may be controversial, but it’s as removed from large corporations doing bad things with genetic engineering as one can get. At the root, it’s about inspiring people and educating them — and getting them to participate in a small way. Yes, it’s being championed by companies, but both are tiny startups just a few years old, run by smart, well-trained young scientists. They’re thoughtful and considerate people, and active members of the open science community. They’re publicly sharing all aspects of the project. There’s no profit motive here. If anything, they’ve taken on some massive risks by their trailblazing. Without question, synthetic biology is a powerful technology. I maintain that it’s the most powerful technology we’ve ever created. It’s disruptive — possibly a complete game changer when applied to some of humanity’s most pressing challenges in energy, medicine, and sustainable manufacturing. That’s the good side. Of course, it can and will also be hacked to do bad things, too, something security expert Marc Goodman and I consider in our recent Wired UK article exploring bio-crime. Even if the seeds for glowing plants never do make it out into the world, it’s already too late to stop grassroots, crowd-funded synthetic biology from being explored by thousands more innovators. The ideas have been scattered into the world. The glowing plant project is just a visible indicator that times have changed and there’s no going back. It’s time to find the right way to move forward. Andrew Hessel is KurzweilAI Biotechnology Editor. He is a Distinguished Researcher with Autodesk Inc.’s Bio/Nano Programmable Matter group and co-founder of the Pink Army Cooperative, the world’s first cooperative biotechnology company, which is aiming to make open source viral therapies for cancer.